For the nuclear power, aerospace, petroleum and petrochemical industries, the emphasis on safety and accident prevention has never been greater – increased public scrutiny, stepped-up industrial safety regulations, and more stringent OSHA oversight and fines. This means that positive material identification (PMI) in alloys used throughout the physical plant is no longer a choice, but a necessity. 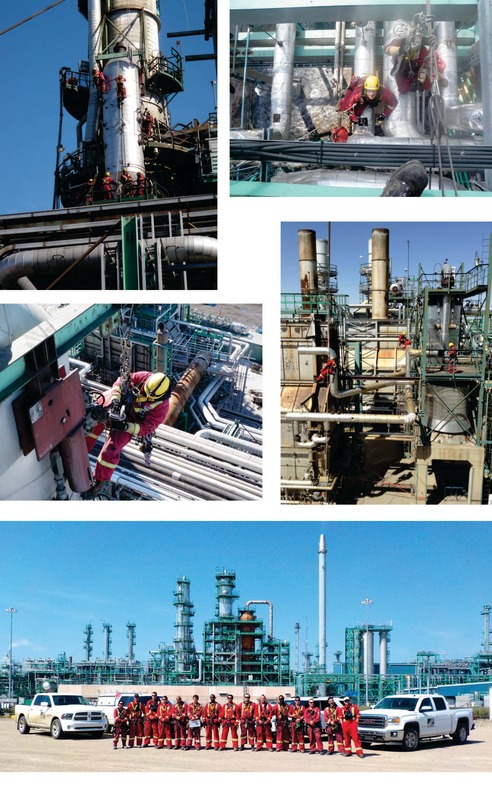 Fatal accidents and injuries, as well as leaks, premature pipe replacements, loss of property, and unplanned outages at refineries and oil rigs often can be traced back to faulty or counterfeit metal building components, sulfidic corrosion of piping and equipment, or because piping is made from material that does not meet specifications, specifically improperly prepared or alloyed weld material. Positive Material Identification helps ensure the integrity of pipelines and critical metal assets. With industrial safety regulations becoming increasingly stringent (e.g. American Petroleum Institute standards), the process of inspecting and analyzing individual component materials is now a primary concern, and positive material identification (PMI) of alloys used throughout the plant is a necessity. Grant David Lamb, the project manager for the Western Canadian office of Acuren Group and Tacten Industrial Services Inc. sent us some photos of his multiple crews in action. They performed positive material identification (PMI) on metal pipes via rope access. These crews have a dangerous job, and it looks like a scary task in these photos, but what’s more scary is knowing that without PMI using XRF analysis, a major catastrophe could happen. I would not like to do that!!! As an NDT (Non-Destructive Testing) equipment/products supplier, I’ve often been in contact with rope-access specialists. As for divers who practice underwater NDT or welding, they are first concerned by their own safety, and are indispensable to the safety of all of us. Bravo!!! Yes, they are brave workers… and we are glad there are some brave people to help ensure our safety! Thanks for your comment Patrick. Being a PMI technician for more than 15 years, I have worked along side many of the great rope access teams such as Tacten Industrial. I am still amazed at the proficiency and level of training these crews undergo. All a testament to their great safety record and overall success. They are a true example of TEAMWORK. Thanks for your comment Patrick. Being a PMI technician for more than 15 years, I have worked along side many of the great rope access teams such as Tacten Industrial. I am still amazed at the proficiency and level of training these crews undergo. All a testament to their great safety record and overall success. They represent the true meaning of TEAMWORK.